The Easter Eggs are scattered for the most part within the "Discography" section of the disc, and do not seem to be in any specific order. Most are only a minute-and-a-half long, though at least one stretches to almost seven minutes in all. To access the first bunch of the shorter Easter Eggs, go from the main menu to the "Features" option, and from there click on "Discography". 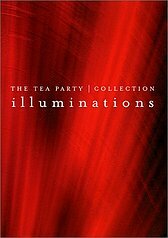 The resulting page shows all of the Tea Party's various CD releases. The eggs are available via only two of the CDs: the first one ("Splendor Solis") and the latest one ("Tangents"). If there are eggs hidden within the other CD sections of the disc, I couldn't find them. After selecting "Splendor Solis" in the above-mentioned "Discography" section, use your DVD remote to highlight the "Discography" option which is shown in the horizontal menu bar located at the bottom of the screen. Do *not* press your Enter button at this point. Press your Up button on your remote control instead (just once). The on-screen cursor box will disappear if you do this correctly. Press your Enter button now. You will be taken to one of several available TV interview segments with the band, intercut with live concert footage (from 1993?). Other, similar segments can be found elsewhere in the "Splendor Solis" CD section, e.g. on the second of two "Special Facts" pages (press "up" to highlight "previous page" and then press your Right button once and enter). Find other eggs in the "Release Dates" section and in the "Splendor Solis" Credits area…. just hunt around, they're there! The back cover of the DVD itself mentions that one of the disc's main features is "behind the scenes footage" of the making of the latest Tea Party music video, "Walking Wounded". This interesting making-of featurette (roughly six-and-a-half minutes long) is ITSELF an Easter Egg, oddly enough. To get to it, once must first visit the "Tangents" section of the disc (as mentioned above). From there, go to the "Track Listings" area. Highlight the "
Another "egg" can be found in the band's detailed "Biography" section (the egg is several pages into the section; look for the text which begins "Classic Tea Party songs..". ; highlight "Features" and press your Down button before pressing enter). There are probably other eggs to be discovered. Go into "Features" from there go into "Photo Gallery" then when you get to the last page of the Photo Gallery section highlight "Features" then press your Up button on your remote the cursor should disappear and click enter to get Tour Posters from The Tea Party tours.